On smooth flat terrain, a touring bicycle is at very little disadvantage to an unladen bike -- wheels are remarkably efficient. In mountainous terrain cycletourists grind uphill and coast downhill, spending much of their time ascending in extremely low gears, at slow speeds. There are no secrets to elevating a mass from the bottom of a hill to the top. Not even lower gears undermine the fact that work is the combination of force and distance, in which force is determined by the mass of the bike and rider, and the angle of the grade. Lower gears make many steep grades rideable, but a lighter load is the only real secret to scaling mountains and pedaling the land. It's just easier. With less equipment the cycletourist climbs more nimbly, maintaining momentum and covering distances with ease. On unpaved surfaces, tire pressures can be optimized to quietly and comfortably float over obstacles and washboard. 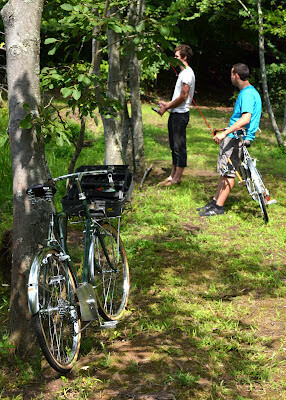 And on terrain that challenges the limits of rider and bicycle, having less stuff may be the only way through. Rough surfaces and high pressure tires are the cause of many physical discomforts, as well as broken rims, racks and spokes. I prefer a tire in excess of 40 mm for most of my riding, while a 45-50mm tire enables more rugged mountain roads. I am excited that the new VO Campeur frames features generous tire clearances. 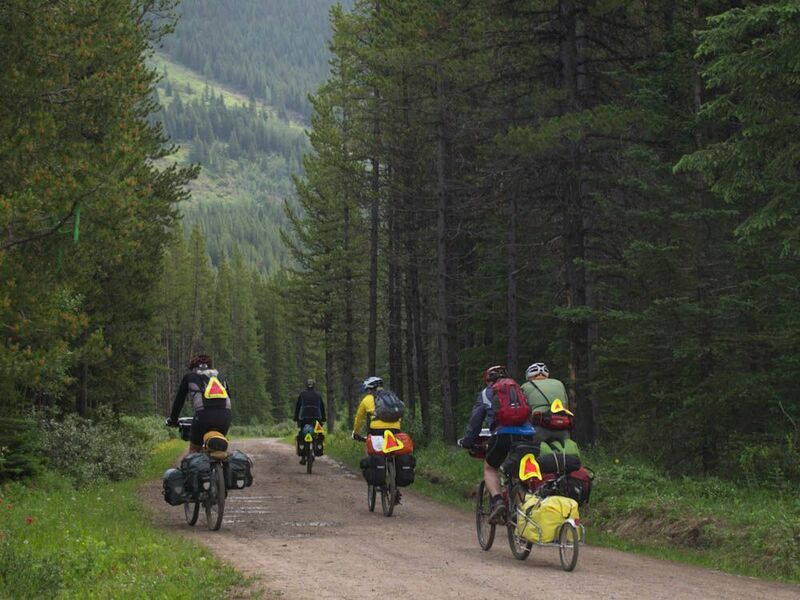 Tires up to 42mm (45mm on the 59cm and 61cm sizes) allow for mild off-pavement riding on cyclepaths and most forest service roads, as well as for comfort and safety. The growing options for larger 700c tires include several from Schwalbe and Vee, the Clement X'Plor MSO, Panaracer Fire Cross, and the prevoyant Bruce Gordon Rock'n'Road. Many smaller cross-type tires are also suitable and will fit under a fender. Initially, I appreciated vintage 80's touring frames for all-purpose riding, but was drawn away due to limited tire clearances and inflated prices on the used market. The Campeur kills both birds. 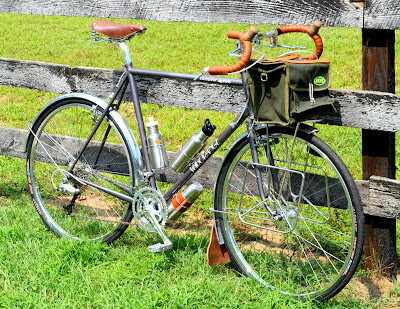 A Campeur with racks and panniers is well-suited to paved roads and graded rail-trails -- traditional touring fare. With a tidy, lightweight load and larger-volume 700c tires the Campeur is an American Pass Hunter capable of our scenic and remote roads as on the Great Divide Route. Strap a bedroll to the handlebars and attach a saddlebag. The Campeur turns from a capable gear-hauler to a dirt-road scorcher-- a real adventure bike! The secrets of a lightweight load are not in sawing off toothbrush handles or titanium sporks. Avoid redundancies and bring only what you need. While backpackers have known the benefits of lightweight travel for years, cycletourists have a tendency to “fill the truck”. Comfort, safety and preference will determine personal equipment needs, while packing for worst-case scenarios will ensure a heavy bike. Expect real conditions and plan for them; don't “what if” yourself into an extra pannier full of gear. Provisional items such as batteries, bandages, and the remaining six books in the series can be left at home and sourced along the way. Additional clothing, food and water are available in more places than you will require. The fact is, most cycling occurs along roads of some kind, and along roads are people and resources, and most often a willing pick-up truck in the event of a worst-case scenario. When planning my adventures I pack relatively little clothing, rotating several t-shirts, socks and underwear with a single pair of nylon athletic shorts. Clothing quickly becomes laundry on the road, and touring the land with a bag full of smelly socks isn't particularly attractive. In the summer months I find it refreshing to swim multiple times daily, rinsing soiled clothing to maintain a reasonably clean exterior. 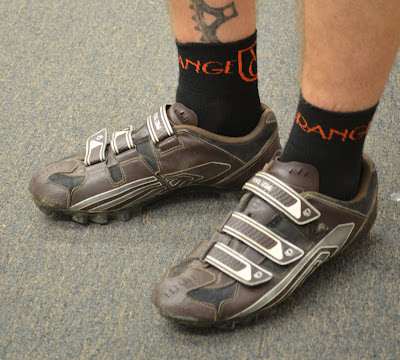 I wear a single pair of reliable shoes for riding and walking. This is convenient when I require to push my bike up a steep, rocky grade. When the temperature drops, I expect to empty my bags wearing most of my layers, pairing a down jacket and thin wool long underwear with a 30-deg down sleeping bag. In the coldest weather, a vapor barrier liner allows me to comfortably sleep down to single digits inside my tent. If you are inclined to spend money on kit, replacing an older inexpensive tent and a too-warm sleeping bag will make the greatest reductions in packed size and weight. 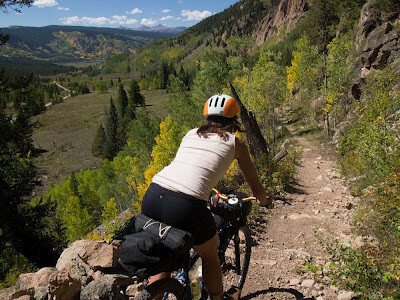 The remaining gear for a cycling trip is usually already in your closet, and only small reductions in weight and volume can be achieved with new equipment. Better to leave gear at home than to buy “lighter”. As such, lightweight cycling need not come at a great expense. While my personal needs currently require a brick of electronics, one could easily pack 25 lbs. or less, including several day's sustenance. Regarding food and water, I typically prepare for the exact distance ahead, with a small reserve for unexpected delays. Considering the hundreds of dollars invested in lightweight equipment, one could easily negate the benefits of sil-nylon and tinanium with 20 lbs. of excess food and water. By consuming most of my food before resupplying, the average weight of packed food over time (full+empty/2) is minimized. Running low on food, but not starving, is a sign of good planning. 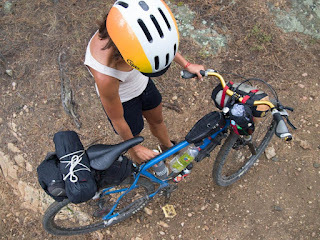 Water is usually the single heaviest thing on a loaded bicycle: in wet climates I rarely fill more than one bottle, and I camp near water sources. A popular hiking tip is to “camel up” by drinking a liter of water at the source to avoid carrying it on the bike. Of course, water is quite precious in arid climates; it may be unavoidable to carry several liters, or more. 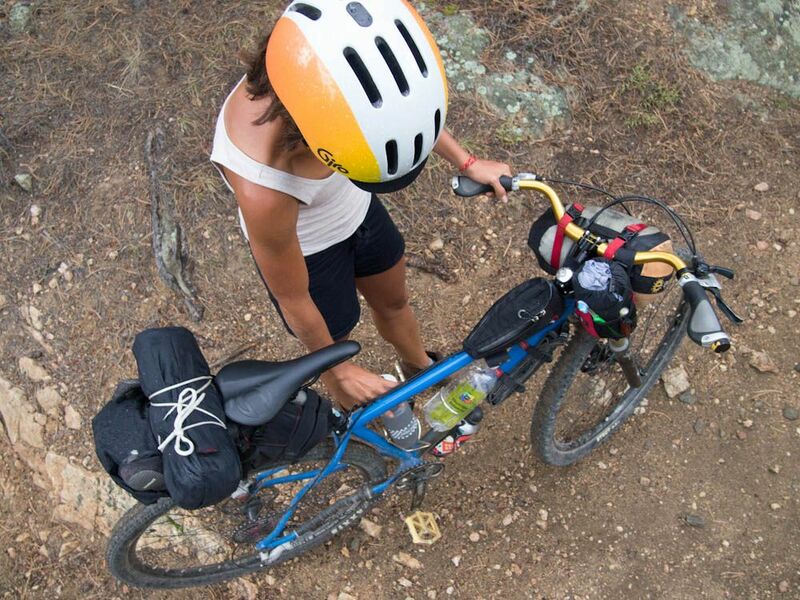 How to pack gear without a full load of panniers? Reducing a load from four panniers to two is a good start. The effects of a lighter load are multiplied by the support equipment that becomes unnecessary, including racks and bags, stout wheels, and a “proper” touring frame. 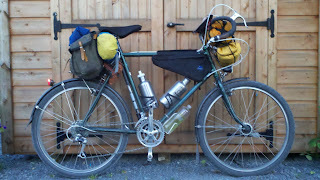 The Ortlieb panniers and Jandd racks I used on my first trip four years ago weigh over 12 lbs. and burdened me with extra clothing and food. 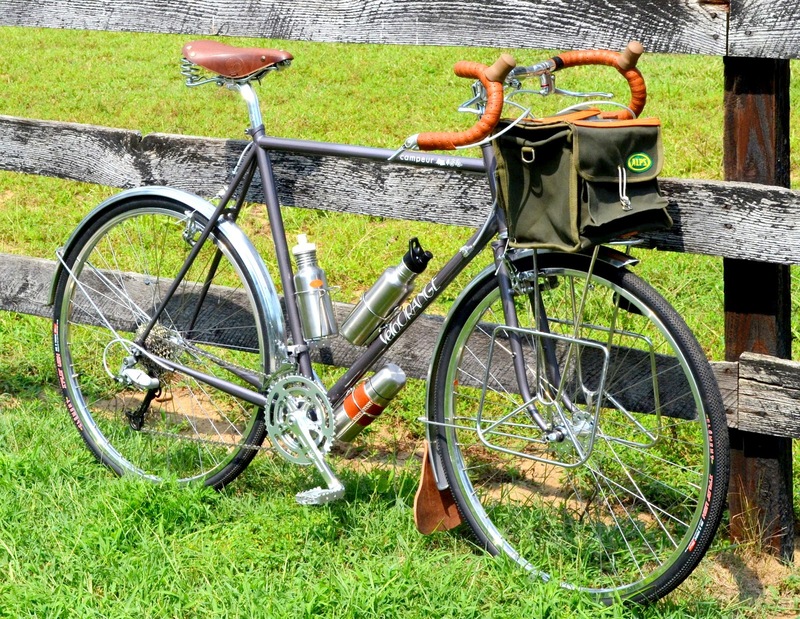 Parting with panniers entirely, a “rack-lite” system may use an existing rack or a mini-rack. The VO Pass Hunter supports a handlebar bag, saddlebag or a drybag attached with straps, but it doesn't support panniers. Independent of weight, the benefits of riding without panniers are threefold: a quieter ride on rough roads, a narrower profile with greater ground clearance and aerodynamics; and distribution of mass near the center of the bicycle. Last year the Pass Hunter provided a strong lightweight saddlebag support mounted to the rear of my Schwinn High Sierra, cradling a Carradice Camper over many thousand miles of pavement and dirt roads. Without a heavy load and the need for rack fittings, almost any bike can serve as a touring bike. With the ability to cover distances more easily, even fewer supplies are needed on-board-- it's a slippery slope to a really enjoyable, ridable bike. Further refinements exclude racks of any kind in favor of “soft” attachments. This mirrors the revolutionary philosophy birthed in lightweight internal frame backpacks in the 60's, the origins of the modern backpack. Framebags are made from durable “sailcloth” materials and provide efficient storage within the main triangle of the frame, relying upon the structure of the bicycle frame as the backpack relies upon the human skeleton. Modern accessory bags can be fit to the toptube, handlebars, or seatpost, while strapping a drybag to the underside of the saddle or handlebars is an inexpensive, lightweight approach to carrying gear. The growing availability of refined “bikepacking” style bags inspired by mountain bike touring and racing comprise one of the fastest growing trends in touring, and are almost exclusively handmade in the USA by local craftsmen. There's a lot to like about it, most importantly, the ride. This is how I would load my Campeur. While lightweight travel is often considered the realm of endurance racers, randonneurs, and mountain biking “bikepackers”, the benefits of lightweight touring are for everyone. It need not be legitimized by epic distances and record times, or even an obsessive calculation of pounds and grams. Sometimes I ride fast and far, but I never hesitate to share with others that many of my days are spent swimming and drinking coffee, pushing my bike up rutted steep trails, or writing. The measure of success in my travel is fun and adventure. Lighten your load, throw a leg over the top tube and enjoy the ride. Bike Commuters has a new post entitled Interbike 2012: Velo Orange…sooo nice! Lots a photos. 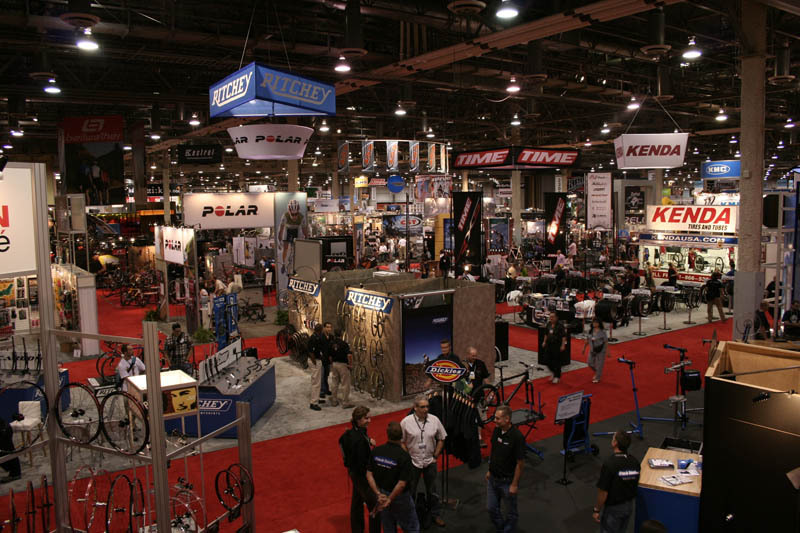 The Path Less Pedaled as an interesting Interbike roundup here. Check out the Interview with Igor at minute-6 of the video. Gravel Grinders is a very cool blog. 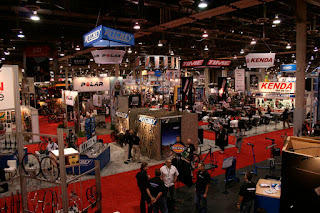 You might like the Gravel Grinder News Interbike 2012 Report. The Campeur is near the end. Guitar Ted liked the gravel racer build Campeur frame we displayed at Interbike. The full post is here. 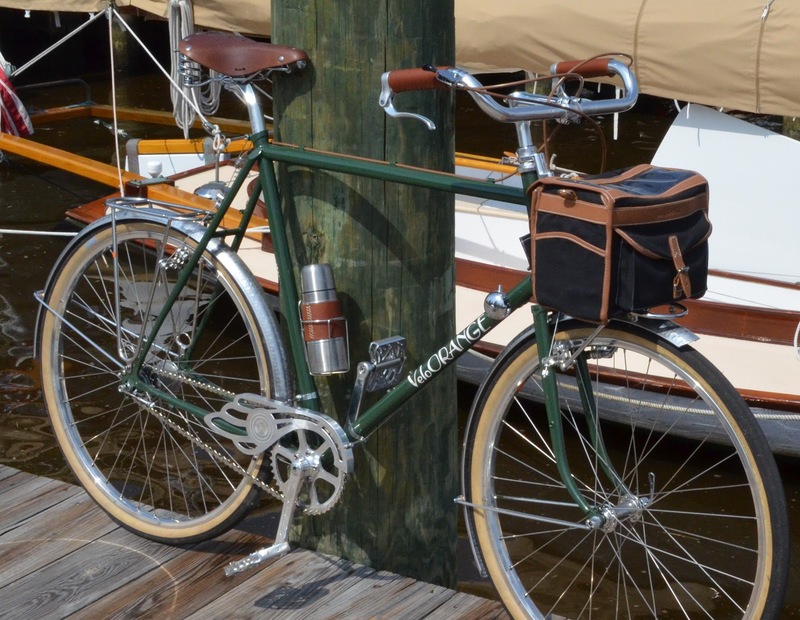 Lovely Bicycle posted some lovely Interbike photos on Instagram as well as on the blog. Then there is a small mention in All Hail The Black Market, a blog that's, well, hard to describe, . Thanks to all the bloggers who mentioned us. By the way, we're happy to send products for review to those of you who have well known blogs with a solid following; just shoot us an e-mail. 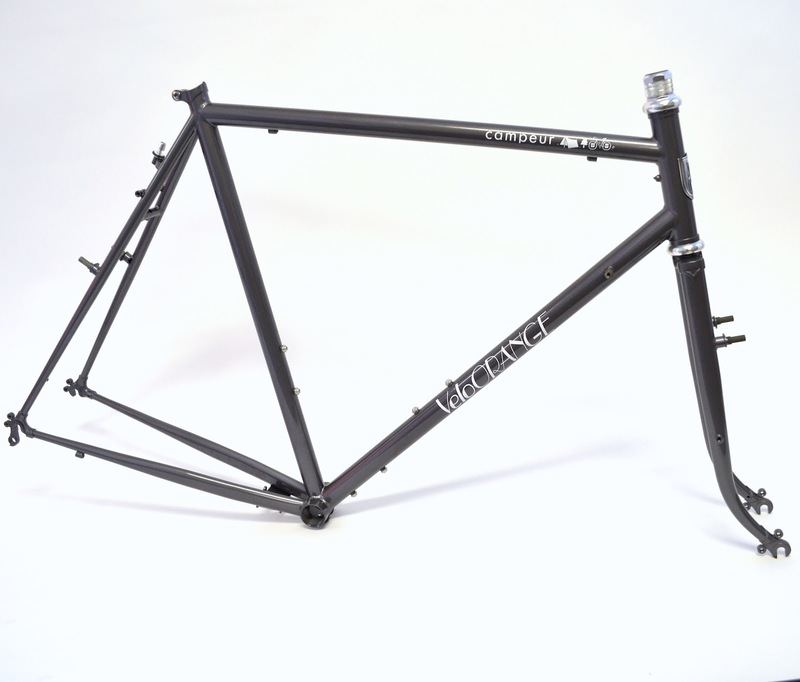 The VO Campeur frames are finally here. It's taken a lot to make these, including almost a year of testing. We rode the campeur with front loads, with rear loads, with mixed loads, and with no load. We tried four different forks to get the best possible handling. 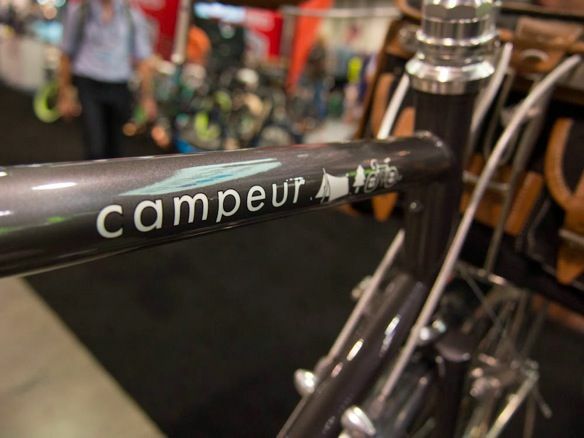 The Campeur, as the name suggests, is a touring bike for paved, or unpaved, roads. It can carry a substantial load for long unsupported trips, yet handles beautifully even with no load. In fact, it makes a nice gravel racer. 4130 double butted chrome-molly frame and fork. 1" fork with lovely French-style bend. 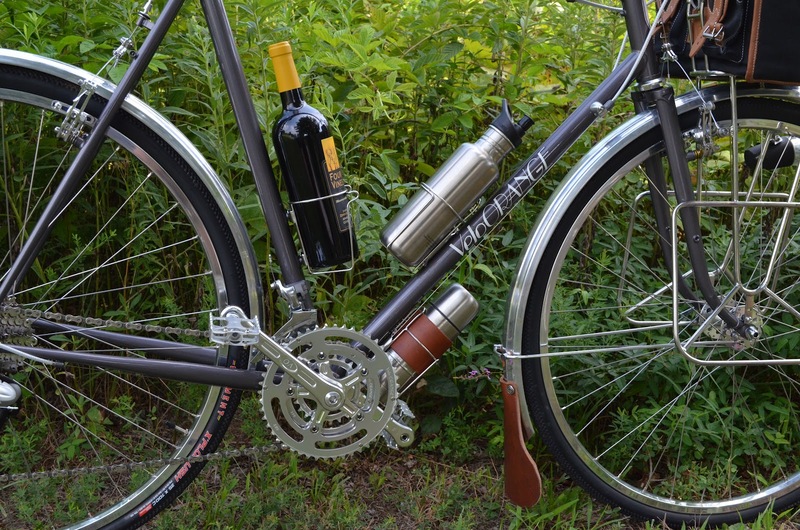 Uses a traditional quill stem (or adapter and threadless-style stem). Clearance for 38mm tires with fenders. Canti brake bosses. Seatstay cable stop with adjuster. Vertical dropouts with double eyelets front and rear. Fender bosses under fork crown, at seat stay bridge, and at chain stay bridge for easy fender mounting. Three water bottle cage mounts. Kickstand plate, because touring bikes should stand up. Metal head badge. Top tube decal by artist Dan Price. Frame geometry can be found at this link. Most our technical staff left for the Interbike bike show yesterday. I'm flying out later today. That means that, for the rest of the week, there will be no tech support via telephone. If you have an urgent question please e-mail and we'll try to answer from Vegas, but there may be delays. The entire warehouse and shipping staff is still here so there will be no delay in getting orders out. I thought I'd post a few photos we took recently for a VO brochure. We shot them at a nearby pond, so we got in a little fishing. I was reminded of these when I took my 13-year old son fishing on the upper Potomac yesterday. I'm not much of a fisherman, but he loves it, so I cast a few times and occasionally catch a bluegill or a little bass. 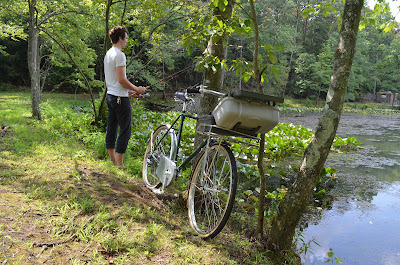 Do any of our readers use a bike to go fishing? That last photo is of my newly built up Campeur. Note the knob grips with guidennet levers, as was common on the old French campeurs. There's also a different style of mudflap that we might make, a reproduction of an old French shape. The Big Pedal Named, "Sabot"
Thanks for all the great pedal names. We just had a staff meeting and chose "sabot", submitted by Everett. (Everett, please e-mail your last name and address.) A sabot is a bulky French wooden clog. 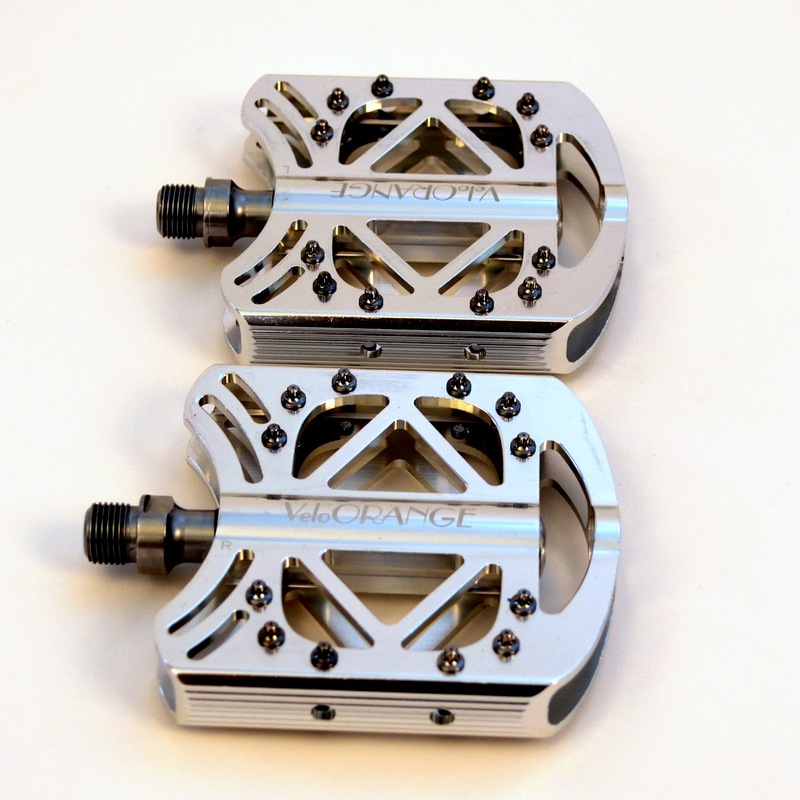 If you wore sabots you would want these pedals. We checked with the factory yesterday; the Grand Cru Sabot pedals should be here in about 6 weeks. We just received a small air-shipment of our new chainguards. 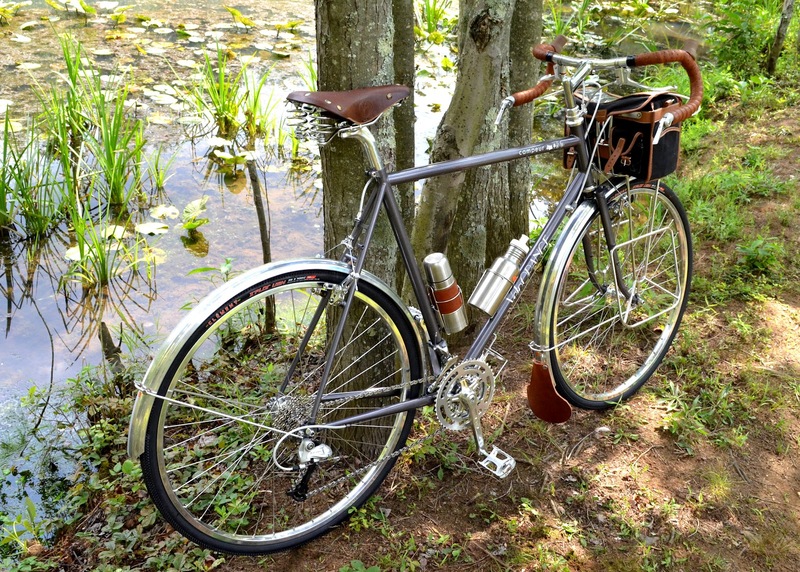 The Grand Cru Plume Alaire chainguard harkens back to the golden age of French city bikes. Back in the day there were dozens of companies competeing to make the most elegant chainguards. They kept one's trouser cuffs presentable and added a bit of style to even the most pedestrian city bike. Today those old chainguards, especially the nicer models, are very pricey and more apt to be in collections than on bikes. 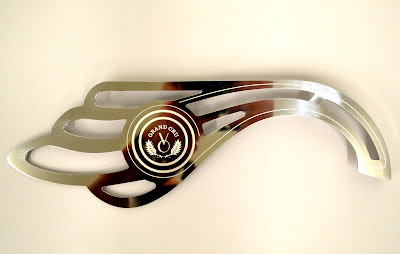 The Plume Allaire chainguard is cut from aluminum alloy and etched with the Grand Cru logo. Mounting hardware that fits most steel frames is included. These are our newest pedals. 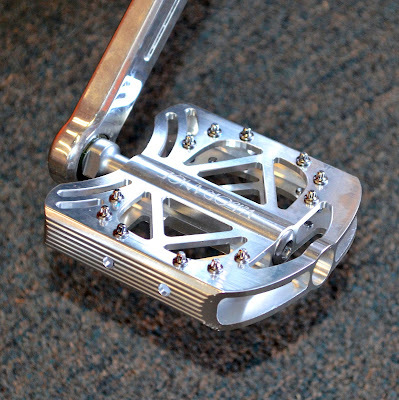 Many VO staffers like large pedals so we wanted to make a really high quality large-platform pedal that would be comfortable even when riding in thin soled shoes. I tested them in espadrilles and minimalist running shoes. 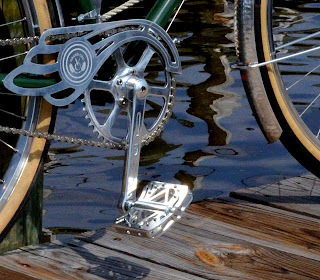 Of course this style of pedal is great for urban riding. But we see other uses too. More and more bike packers, long distance tourists, and adventure cyclists are riding with big BMX style pedals, and these make a more refined alternative. The two-sided platform is a CNC cut aluminum extrusion. It's big, approximately 100mm wide and 100mm long. There are six replaceable traction pins on each side of the pedal to offer great grip even when wet. We include rounded pins with the pedals so as not to damage street shoes, but they are easily replaced with more aggressive sharp pins. 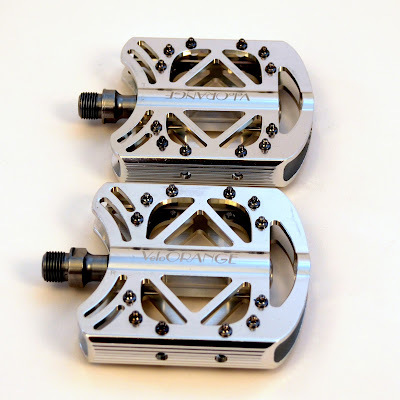 Most existing pedals with large platforms use either loose ball bearings or are designed for BMX or downhill riding and use durable, but stiff, bushings. We designed a chrome-molly spindle that uses three sealed bearings, two inboard and one outboard. This makes for a very smooth pedal; it feels like a real high-end road pedal. And the bearings are easy to replace. These won't be inexpensive pedals, but we think the durability and feel will make them worth the cost. We call them "the big pedals." That's the official project name. But we realize that we should probably find something better. So we'll give a pair to whoever comes up with the best name. (Be sure to use your name in the comment so you get credit.) The pedals will be in production soon and we hope to have them here in a couple of months. Update: We chose the name "Sabot." Please see the post above for details. That's right, VO axle wing nuts are back in stock. Many of you, especially our UK customers, have been asking for these again. This batch is made using new tooling and has a slightly different shape than the MK1 version. 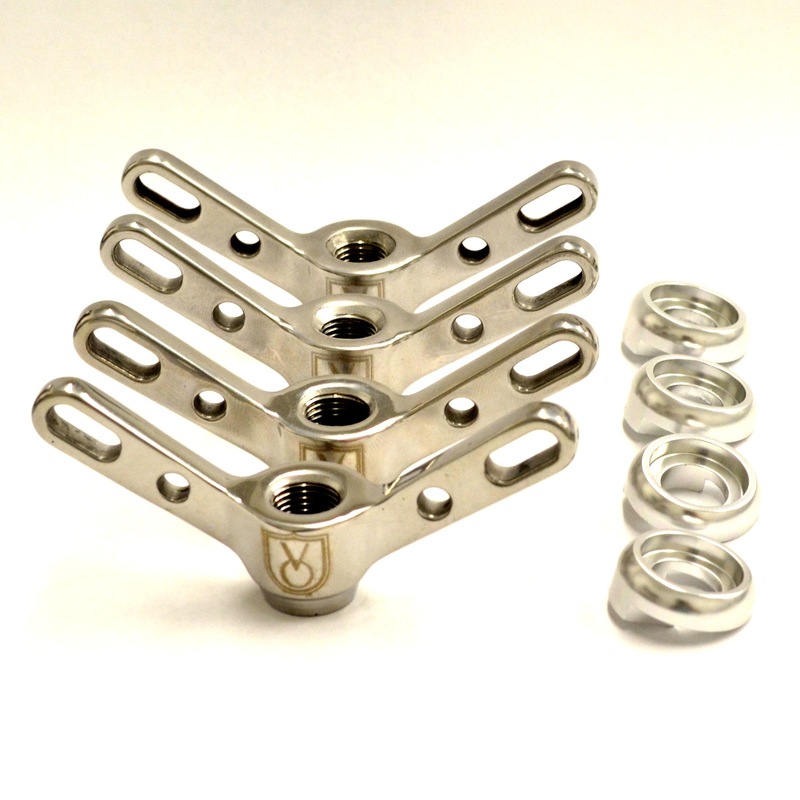 They are made from beautifully forged stainless steel, CNC machined, and polished. They exhibit a cool machine-age aesthetic. Included are matching CNC machined keyed washers. 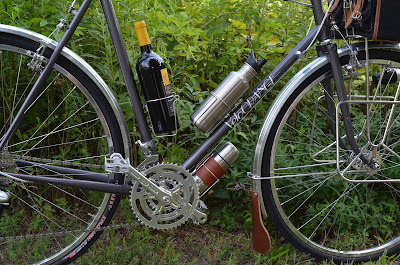 Great for fixie and single-speed bikes--no need to carry a track-nut wrench. Available only as a set of four, two front and two rear (9mm and 10mm). They work on solid axle hubs, not quick release. The Grand Cru all-leather tapered saddle bag is designed to fit everything you'll need for a day on the road. 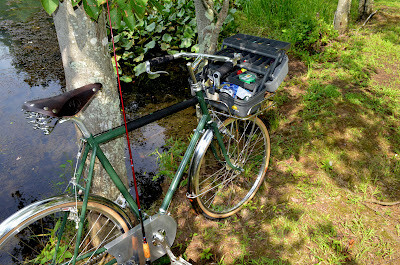 There is room for a mini-pump, multi-tool, tube, banana, wallet even a light rain shell. 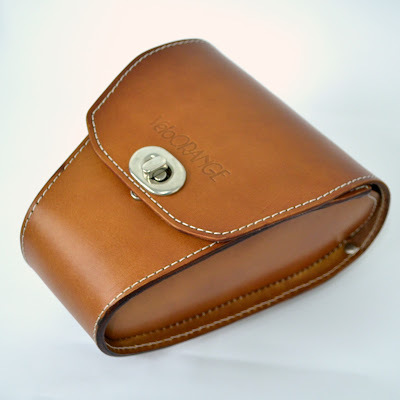 Being semi-rigid, it offers some protection for fragile cargo, like your camera, or a couple of fresh eclairs. The swivel latch makes it very easy to open, but keeps the cover secure. 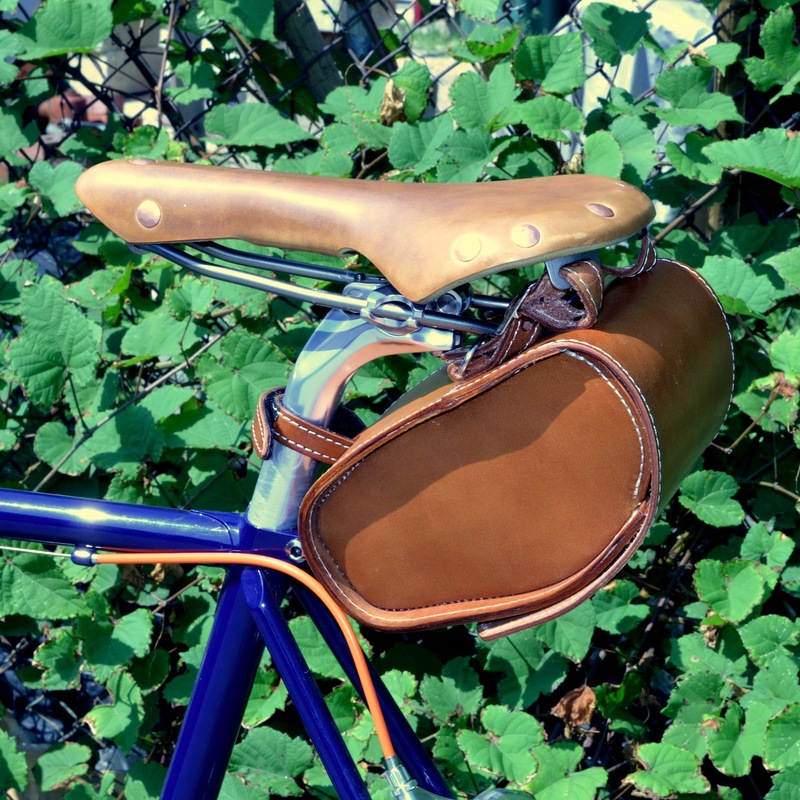 It attaches to bag loops and to your seat post to sit snugly under saddle with little sway. Approximately 1.5 liter capacity. We've been super busy this past week preparing and shipping our display to Interbike. This is an industry only show, but is very important since we can show our products to thousands of bike shop owners and buyers. Hopefully we'll get many more new dealers. We once again have a 20' x 20' space and will be displaying five complete bikes and most of our components and accessories, including a few new items. Our booth number is 7116; please visit if you're there, or ask you local bike shop owner/buyer to drop by. 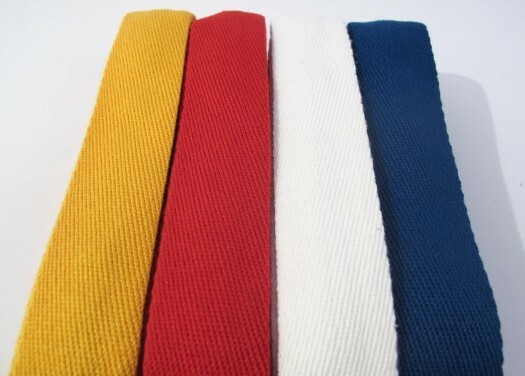 We have some new Comfy Cotton handlebar tape. While there have been some new brands of cotton tape introduced, most are pretty similar to Tressosstar tape, save for different colors. We decided to import this tape because it's wider and thicker than traditional tapes. If you like it we'll get more colors. The Campeur frames are almost here and production is finished on the Campeur racks. The chainguards I mentioned recently are also about done and, since they are light, we'll airship a box or two. We are also making extra hardware kits; so you can easily mount that classic French guard you found on E-bay. For those of you in need of fall fashion inspiration, there are the new ultra-stylish VO socks.